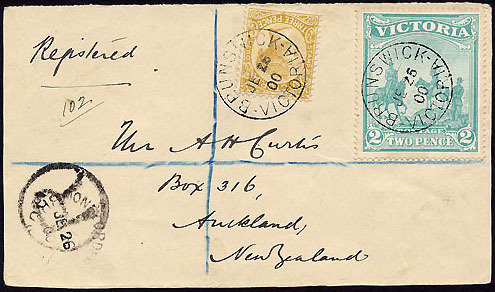 The 1900 Patriotic Fund issue of Victoria - 2d (2/-) on cover. Genuine use of either of the 1900 Patriotic Fund stamps is extremely difficult to locate. There are many covers which bear one of the stamps or both but which do not pay the correct rate. 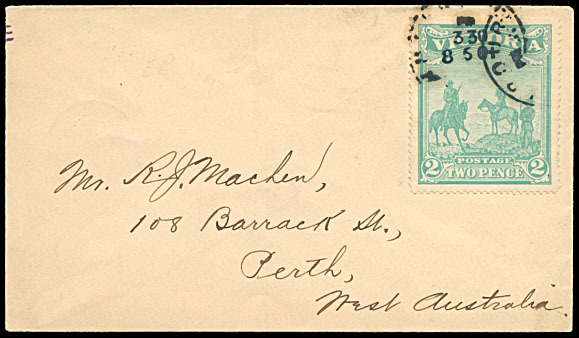 There are however some covers which, although perhaps fabricated to some extent, still pay correct rates and also appear to have been through the appropriate postal procedures. 2d (2/-) stamp on First Day Cover (22 May 1900). The 1d FDC is shown elsewhere. Both of the covers shown below have their counterparts with the 1d (1/-) stamp attached. Prestige Philately June 2010 Lot 684.
and cancelled at Moonee Ponds 22 March 1905 with additional strike at the left. Status Auctions February 2007, Lot 1680. Listing of covers with a single franking of the 2d (2/-) stamp. Prestige Aug 2011 Lot 496. Status August 2011 Lot 1737; Feb 2012 Lot 1697. 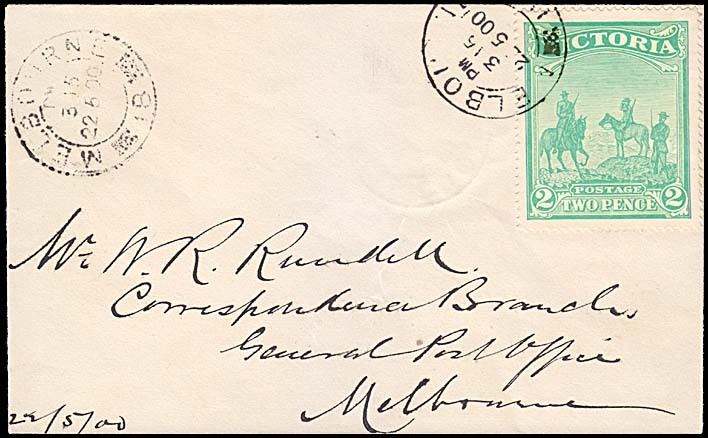 National Bank of Australasia envelope addressed to Miss Nesbitt at Rose Park, South Australia. stamp rotated 90º clockwise. Correct interstate rate. Prestige Philately June 2010 Lot 690A. 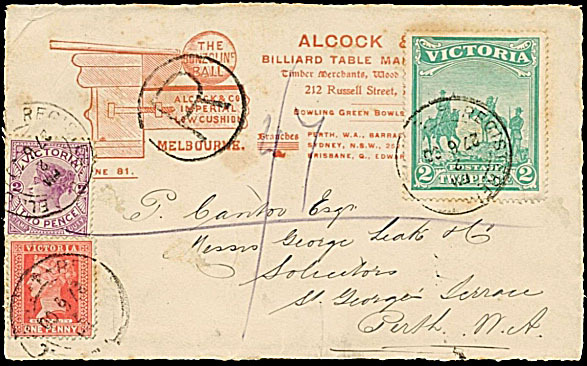 This cover - and its companion with the 2d (2/-) Boer War stamp - is on a cover advertising Alcock & Co., Billiard Table Manufacturers of 212 Russell Street, elbourne. Alcock is credited with bringing the game of billiards to ite high level of popularity in Australia during the 1800s.